On a dreary Saturday morning of September, our adventure as SELA Cohort 2017 started by getting on a bus which would take us to a mysterious location – the only clue we had was that it was somewhere in the Peak District – to do an equally mysterious “Induction Bootcamp.” Everybody was tired as it was relatively early, especially considering that some, including me, had just moved back to Sheffield after spending the summer home or abroad, so on our way there the minibus was rather silent, apart from the occasional chat prompted mainly by our curiosity to discover the location. Nobody was expecting anything special, so there was a general expression of amazement on our faces when we entered the gates of the actual event. We were immediately welcomed by Gary, Head of SELA, who led us to the room where the activities would take place. After a brief time to chat and get to know the people with whom we shared the table, the workshops started promptly. During the weekend we had the chance to take part in a variety of activities that allowed us to get a taste of what we can expect from SELA during this year, but at the same time these already made us start to recognise our own strengths and weaknesses and offered several ways in which to start improving straight away. I will now outline a couple of major teachings I carried home with me after this fruitful weekend. The activity which made me realise this was the “Presentation Skills” workshop, led by a former SELA member who has now successfully established a business specialising in presentation skills. I had always considered myself rather good at presenting, especially considering English is not my first language: I tend to follow a logical flow, I rarely stutter, usually I am not nervous, and I am able to improvise in case something does not go smoothly. These certainties were reinforced by the initial activity, which consisted in giving a two minutes presentation on a random topic which we were assigned with just two minutes to prepare. Some people were evidently nervous, some could not make it to the two minutes, while I was able to deliver what I thought was a decent presentation filling the two minutes, especially considering the odd topic I was assigned: Velcro! However, analysing the recording of my presentation together with the mentors, grading it following the guidelines given by the workshop leader, I realised that some of the traits I regarded as points of strength were inappropriate presentation behaviour instead. For example, I tried to deliver a continuous presentation, with few to no pauses as I thought pauses indicated I did not know what to say, while we were taught they are useful instruments to shift between topics. Moreover, I used to move around quite a lot, rocking back and forth, believing it showed I was at ease, while in reality it just distracted viewers from the actual content of the presentation. 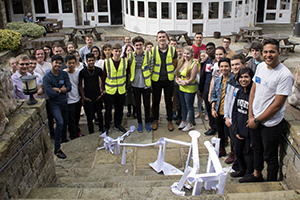 Another example arises from the final workshop, which consisted of splitting into four teams to build the four sections of a marble run out of paper and sticky tape, which would be then assembled together. 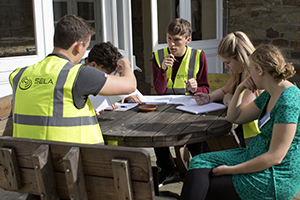 The difficulties arose from the fact that each team had its own specifications, the teams could communicate between each other only through “team leaders’ meetings”. Despite a solid start, due to the time constraint, towards the end the works started to get chaotic, with everybody shouting and doing whatever they thought was right without consulting with the rest of the team first. However, in the moment, none of us realised this as we were too focused on delivering in time, without realising that we could have been faster and more efficient if we had stopped and analysed the situation. Here is where the mentors came in. They were either members of the SELA Board or people from industry, so experienced individuals who know what it takes to work in a team and which skills are needed to be leaders. 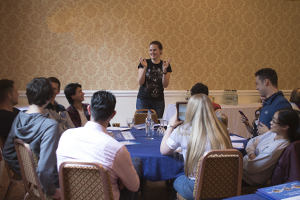 Their help proved invaluable as they provided us with accurate feedback at the end of this and every other session so we could realise what are our true strengths and weaknesses, which we wouldn’t have been able to do without their help. It was actually the mentor following us which made us realise how towards the end of the marble run construction we completely derailed as we panicked seeing the deadline approaching, and she also provided us extremely useful suggestions on how to approach an analogous situation next time. I think that the previous paragraphs show how, despite being just the first two days of a two-year journey, the 2017 Bootcamp has been a great and insightful way to introduce our new cohort to SELA. I definitely look forward to the next meetings and workshops to keep working on my skills and get to know even better the rest of the cohort, and I am already sure that SELA will be one of the highlights of my university years, providing me with a considerable boost in my skills, in my CV and in creating a strong circle of connections. I learned that the process of learning is much quicker and more effective when there are other people more experienced than you who help you realise and correct your mistakes. In the above case, I would have never been able to spot those two possible improvements by myself, mainly because I did not even have the necessary knowledge and experience to realise I was not presenting well and could have gotten better in that.